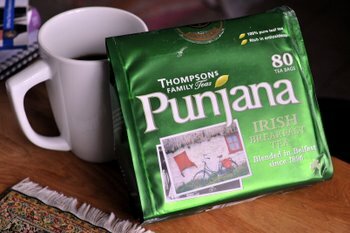 Punjana tea is relatively new to US markets, but readers in Ireland or Scotland will probably recognize the name, as the tea brand has been popular there for more than a century. To give you an idea of how popular the tea is, something along the lines of 60,000 cups of Punjana tea are said to be drunk every hour of the day, 365 days a year. Given that it’s popular Irish tea, it seemed appropriate for me to start out with the Punjana Irish Breakfast Tea for my first tasting of this brand. The tea comes bagged and ready to brew. The tea has a very classic Irish breakfast tea flavor – to the point where it is almost difficult to describe it because it is exactly what you expect to get from a good Irish breakfast tea! It is a strong and smoothly flavored black tea. It is very fresh and “clean” tasting – no dry notes, as from poorer quality tea or tea that has been sitting around too long. The tea takes well to different brew strengths, so double the amount of tea will get you a cuppa that will stand up to milk easily and you’ll still get the same clear flavor as you do from a single teabag brewed black. This is a wonderful everyday tea for a tea fan, or for someone who wants a cuppa that can take the place of a cup of coffee and still be very satisfying.